One of six grandchildren of President Bernardino Rivadavia, Martín began his military career at the age of 13. Training in Buenos Aires, Rivadavia managed to see a bit of action during the war with Paraguay in the 1860s but had a change of heart on his return home. Rivadavia left the Army & enlisted in the Navy. At the time, the Argentine military formed a single, combined unit with both Army & Navy reporting to the same commanding officers. Rivadavia’s first naval assignment involved a patrol of Patagonia against incursions from Chile, following the expedition by Comodoro Luis Py. He rose in rank quickly, & in 1888 Rivadavia was given command of the corvette “La Argentina” which lead the first training mission for new cadets. The next command for Rivadavia was the cruiser “25 de Mayo” & he took the ship to Europe in 1892, representing Argentina during celebrations of the 400th anniversary of the voyage of Columbus. In 1901, Rivadavia had a severe fall, breaking two ribs in the process & suffering a lot of internal damage. Surgery failed to improve his condition & Rivadavia died at the age of 49. 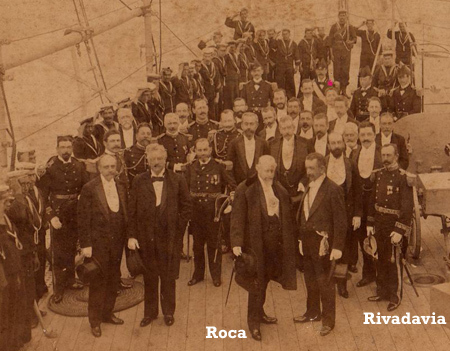 At the time of Rivadavia’s death, President Roca had sent his Vice-President Norberto Quirno Costa to Patagonia for the official foundation of a coastal town. 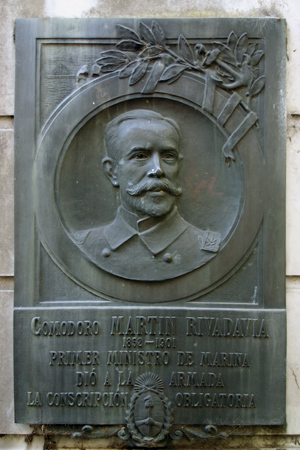 They decided to name the new settlement Comodoro Rivadavia in remembrance of Martín, who was often present in the region. Today, Comodoro Rivadavia is the largest city in Patagonia with production/export of petroleum & natural gas driving regional growth. 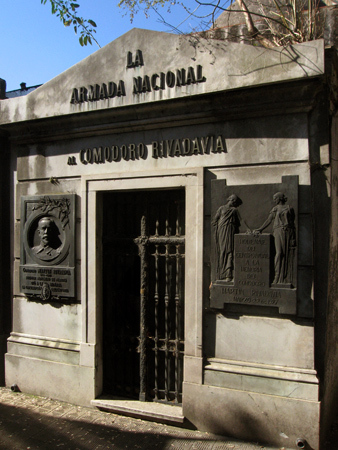 Whether due to the effects of time, carelessness or deliberate vandalism (although rare in Recoleta Cemetery), the glass panes behind the wrought-iron doors to the vault have been broken. 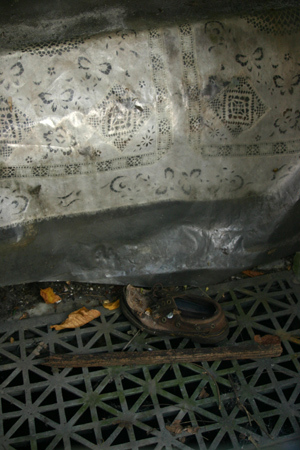 Someone covered Rivadavia’s casket with a sheet of plastic for protection, but the condition of the vault today hardly reflects the service given by one of Argentina’s military best… and who would leave a shoe inside?? And looking to the previoust posts, all that I can say is that, even though their are beautiful, Muñiz’s and Matheu’s graves suffer one of the top problems in Argentine sculpture: what I like to call overdoze of pedestal. True enough. But I wonder if focusing on past achievements rather than recent atrocities might help recover the military’s image. Food for thought. Maybe they wanted the statues to stand out & above the rest in the cemetery? Matheu is in such a bad location that no one sees him at all, even with the extra height. Say hi to the cemetery for me!